In reading reviews about Northern California's Castle Lake, one word came up in almost every one -- and that word is "beautiful." I could not agree more with the description of beautiful, and that's why I titled this blog and photo "Beautiful Castle Lake." I took this photo on July 17, 2018, at 8:15 pm just before sunset. The wind was calm; the lake was quiet except for two ladies in canoes on the opposite side of the pond. They were having a conversation as they were paddling along the shore. They are in the photo, but they are so small compared to the rest of the scene that the only evidence of them in this image is a tiny bit of blue mid-point at the shoreline. The calm and peace of what was unfolding, with the sun lighting the clouds with the reflection off the surface of the lake, amplified the moment. The chatter of the ladies and the buzz of the bugs went away as I gazed on the beautiful scene. Located in the Trinity Mountains in Siskiyou County California, Castle Lake is a tarn (lake) formed by glacial ice coming down off a headwall and scooping out a bowl 110 feet deep ... with a terminal moraine on the opposite side of the headwall. Once the ice melted a lake was formed. All of this happened in the Pleistocene Era around 10,000 years ago, when much of North America was glaciated. 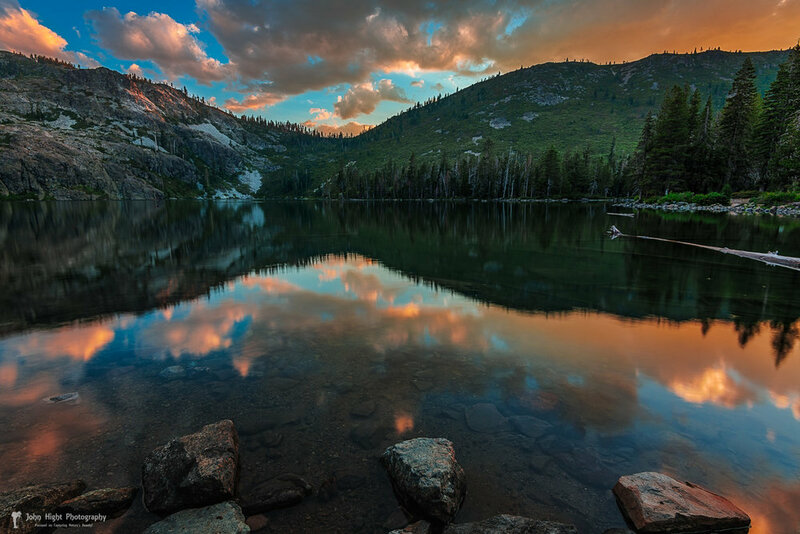 Castle Lake is also part of Shasta-Trinity National Forest which covers two million acres of Northern California. The lake covers 47 acres, is 110 feet deep, and is at an elevation of 5,440 feet. Mountains surround it on the south, east and west with the lake draining to the north into Castle Lake Creek. Access to the lake is very good with a paved road, Castle Lake Road, and a small parking lot at the north end. The north shore has a few picnic tables and a restroom. Trails go along the east and west shores giving limited access but some spectacular views. The drive to Castle Lake is a scenic delight itself, with great views of Mount Shasta, the forest, and the Trinity Mountains. One of my favorite captures of Mount Shasta is when the tree-lined lane lines up to place Mount Shasta in the center of the road, framing the mountain so perfectly. I must get back to taking this picture. I arrived at 7:45 pm; people were packing up and heading down the hill. There was a slight wind, and the surface of the lake was choppy. My first thought was I'm not going to get that mirror-like reflection, but the clouds were hanging in the sky to the south and west of the lake. I decided to position myself on the east shore where I could get a good view of the lake and clouds. I took a short hike to an access trail I found earlier in the day. When I got to the spot the lake was choppy, but the wind was starting to subside. This calming of the wind gave me hope that I would have calm water, with some ripples. I set up my camera with a 16-35mm zoom at 16mm; set the camera to Manual at f/8; focused the camera; mounted a 6-stop ND filter on the lens; set the shutter speed to 8 seconds, and took my first shot at 8:05 pm. I could still see ripples in the water, but I could also see the reflection of the clouds. Then the air became quiet and the lake surface started to smooth out, and by 8:10 the lake was smooth as glass. I did leave the ND filter on to even out any ripples that might occur. The bottom of the started to light, and there was still a beam of light hitting the headwall on the south side of the lake. I checked my settings and adjusted my exposure to capture "Beautiful Castle Lake." I continued to take photos until the color in the clouds faded, just enjoying the beautiful scenery. The color of the clouds did turn redder and looked lovely in the sky and the water; but I chose the 8:15 pm shot because the headwall still had a touch of light and all the shots afterward had no light on the headwall. Being able to stand on the shore of a beautiful lake and take in the sights, sounds, and scents of nature are what motivates me to get up early and stay up late to see the display God gives us to take in a taste of heaven. Thank you for reading my blog on "Beautiful Castle Lake"! Buy a Print or Murchantdise of "Beautiful Castle Lake". Leave a comment on what you liked or how I can improve my offering. Share JohnHightPhotography.com with a friend or on social media. Join my mailing list with the form below and get a free UHD Desktop Wallpaper of "Mesa Arch Sunrise" and get a notice when I post new material. Stop by my gallery, browse, and help me in this endeavor with a purchase of one of my prints and/or other merchandise.